Home Features Chelsea Transfer Centre – Latest! 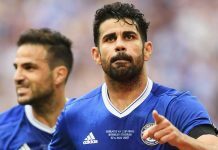 With Manager Antonio Conte being visibly concerned about some of the performances of certain players and the fact he has stated that the squad size will need to be drastically reduced before the season starts, we are expecting to see a busy week or so of players leaving predominantly, and perhaps one of two more arrivals. The speculation and general census suggests that the most high profile player to be leaving is Oscar, who is wanted by Inter for £30 million. But I am also hearing that the Chelsea board are keen to offload either Juan Cuadrado or Pedro, perhaps even both when you consider that Bertrand Traore can also play wide and Victor Moses also impressing the new Manager. Mikel John Obi, Nemanja Matic, Loic Remy are also amongst the names of players who could be sold in permanent deals within the coming days. Then of course we have our loan army, which already boasts a high calibre of players away on loan, but its set to be added to drastically with Ruben Loftus-Cheek looking set to go on his first loan spell, as Nathaniel Chalobah looks set to pip him to a position in the first team squad since impressing Conte during pre-season. Kenedy another who could go out on loan depending on other activity. Ola Aina though is looking likely to become part of the Managers plans this term, Conte showing faith in the youngsters ability already and although will probably start as an understudy, will most certainly break through this season. And then you have the likes of Matt Miazga, who will go out on loan along with Michael Hector. Although Hector is versatile so could be kept as one of the full back covers should we not sign another one. The defence clearly could end up looking thin so this position is still being worked on. Chelsea have not given up on Kalidou Koulibaly and the player has still yet to sign a new contract with Napoli. But reports today also suggest Chelsea are in for Valencia defender Shkodran Mustafi as a potential alternative. A BBC source has stated that Arsenal have made a move as well but Chelsea are closely monitoring the situation of the 24-year old German International, who could be signed at around £15 million. Brazilian youngster Tiago Maia has also been scouted by Chelsea and a move could be made for the 19-year old who’s currently at the Olympics representing his country. But again, he would likely be farmed out on loan straight away, perhaps going back to his club Santos. Romelu Lukaku as well could still very much happen as Chelsea appear to still be weighing up another offer to Everton, who are once again digging their heels in. One thing for sure at this stage is that its going to be a busy end to the window for Chelsea, but so far once again negotiations have not gone well for top targets and I fear that we could be going too far down the pecking order for alternative options as desperation kicks in. I do feel though that instead of signing players like in the past, Conte is more prepared than most to rely on the youngsters. We shall see, Conte sits down with the board this week to discuss the potential arrivals and departures.